Qian, heaven is above; Zhen, movement, is below. The lower trigram Zhen is under the influence of the strong line it has received form above, from heaven. When, in accord with this, movement follows the law of heaven, man is innocent and without guile. 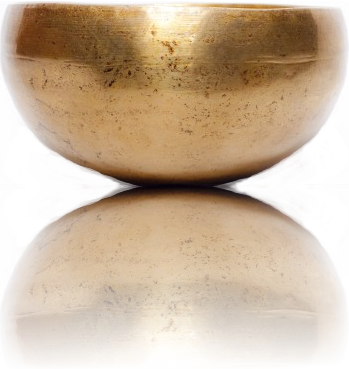 His mind is natural and true, unshadowed by reflection or ulterior designs. For wherever conscious purpose is to be seen, there the truth and innocence of nature have been lost. Nature that is not directed by the spirit is not true but degenerate nature. Starting out with the idea of the natural, the train of thought in part goes somewhat further and thus the hexagram includes also the idea of the fundamental or unexpected. By turning back one is freed of guilt. Hence there follows the hexagram of Innocence. The Unexpected means misfortune from without. Innocence frees itself of mistakes, so that no misfortune of internal origin can overtake it. When misfortune comes unexpectedly, it has an external origin, therefore it will pass again. The hexagram has a very strong ascending tendency; both the upper and the lower trigram have an upward movement. This fact suggests movement in harmony with heaven, which is man’s true and original nature. 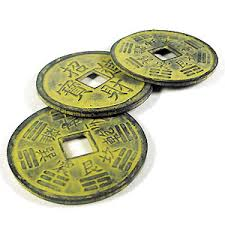 The two nuclear trigrams, Gen, Keeping Still, mountain, and Xun, the Gentle, wind (tree), yield the idea of the functioning and development of the primal trends. Man has received from heaven a nature innately good, to guide him in all his movements. By devotion to this divine spirit within himself, he attains an unsullied innocence that leads him to do right with instinctive sureness and without any ulterior thought of reward and personal advantage. This instinctive certainty brings about supreme success and 'furthers through perseverance". However, not everything instinctive is nature in this higher sense of the word, but only that which is right and in accord with the will of heaven. Without this quality of rightness, an unreflecting, instinctive way of acting brings only misfortune. Confucius says about this: "He who departs from innocence, what does he come to? Heaven's will and blessing do not go with his deeds." Innocence. The firm comes from without and becomes the ruler within. Movement and strength. The firm is in the middle and finds correspondence. “Great success through correctness”: this is the will of heaven. “If someone is not as he should be, he has misfortune, and it does not further him to undertake anything.” When innocence is gone, where can one go? When the will of heaven does not protect one, can one do anything? 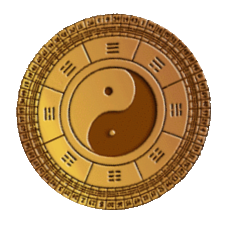 The firm element coming from without is the lowest line, a yang line. It comes from heaven (Qian). The Receptive, in approaching the Creative for the first time, receives the first line of Qian and gives birth to Zhen, the eldest son. Applied to man, this means that he receives the primal divine spirit as his guide and master. 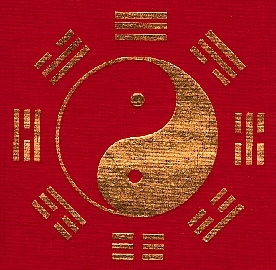 The attribute of the lower trigram, Zhen, is movement, that of the upper, Qian, is strength. 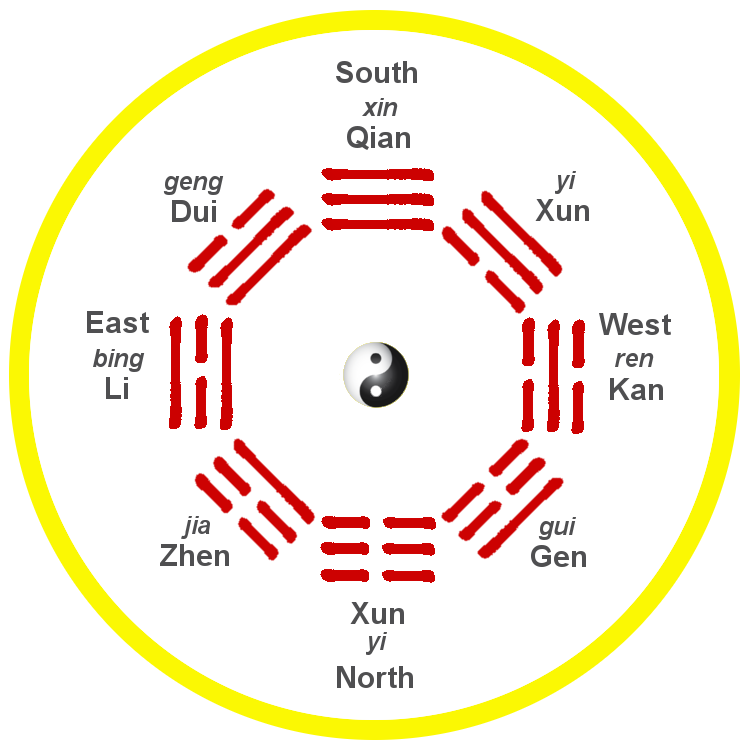 The firm line in a central position that finds correspondence is the upper ruler of the hexagram, the nine in the fifth place, and the six in the second place corresponds with it. This all leads to success, because it shows man in the proper relationship to the divine, without ulterior designs and in primal innocence. Thus man is in harmony with heavenly fate, the will of heaven, just as the lower trigram harmonizes in movement with the upper. But where the natural state is not this state of innocence, where desires and ideas are astir, misfortune follows of inner necessity. This hexagram differs from Pi, Standstill, only in having a firm line at the beginning. If this should lose its firmness, the whole situation would change.